Oregon is a leader in creating a strong infrastructure for electric vehicles. We've partnered with a variety of private companies and other organizations to develop a system that supports electric vehicle operations, tourism and more. Petroleum-based transportation is not sustainable in the long run, either environmentally or economically. Our dependency on imported fossil fuels, impacts of global climate change and the introduction of new carbon emission standards have created an urgency to find alternative solutions. ODOT has sustainability as one of its core values, and it is in the best interest of the state to support a growing EV industry. Currently, the biggest limitation for drivers considering EVs is the absence of a reliable network of charging facilities to increase the range of these vehicles and alleviate fears of “running out of juice.” Even so, by 2020, plug-in cars could account for as much as 20 percent of new vehicles sold in Oregon. That’s why EV charging stations are appearing in key locations around the state. ​Eight states spanning east to west have created a collaborative “Multi-State ZEV Action Plan” that will guide efforts to put 3.3 million zero emission vehicles on the roads by 2025. 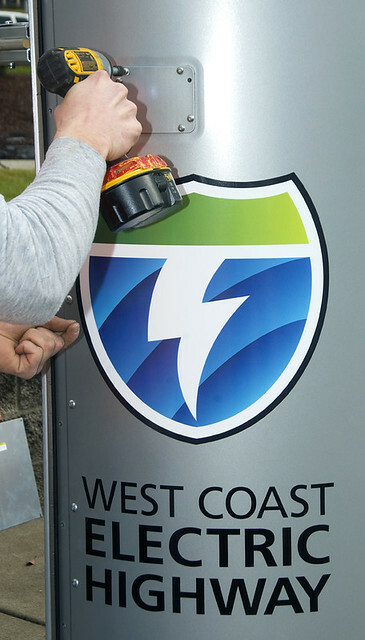 Oregon, California, Connecticut, Maryland, Massachusetts, New York, Rhode Island and Vermont created the first promised milestone for the bi-coastal collaboration aimed at paving the way for the cleanest cars in the nation – ZEVs. The plan focuses on infrastructure, policies, standards and other components critical for the success of a growing market. ​Electric vehicle charging stations are locations where vehicles can plug in to an electrical source to re-charge batteries. EV charging stations are necessary to support what is expected to be a growing fleet of EVs throughout Oregon. In fact, every vehicle manufacturer has announced plans to release plug-in vehicles, and many of them are arriving in Oregon daily. But their popularity will only increase to the degree that there are charging stations available for vehicle owners to re-charge their cars. And the charging stations have to be conveniently located to ensure EV owners they don't get stranded in between charges. Contact ODOT's Office of Innovation at OfficeInnovation@odot.state.or.us​. Zero-emission vehicles are becoming widely available for all kinds of vehicle types. Visit ODOT’s page for Transit Fleet Electrification to learn more about the opportunities for electric buses. Sign up to receive automatic email updates on this topic.